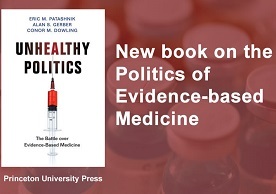 Authors Alan Gerber, Eric Patashnik and Conor Dowling recently published their book, Unhealthy Politics: The Battle over Evidence-Based Medicine (Princeton University Press). The book delves into the U.S. healthcare system’s massive inefficiencies, the reasons why our system is much more expensive than other countries, its over-treatment and under-treatment of patients, and why politicians have been so reluctant to embrace the cause of evidence-based medicine. CSAP Director Alan Gerber is also Dean of the Social Sciences Division, ISPS Resident Faculty Fellow, and Charles C. and Dorathea S. Dilley Professor of Political Science at Yale University. Eric Patashnik is Julis-Rabinowitz Professor of Public Policy and Political Science, and Director of the Public Policy program at the Watson Institute for International and Public Affairs at Brown University. Conor Dowling is Assistant Professor of Political Science at the University of Mississippi, and a former Postdoctoral Associate at the ISPS Center for the Study of American Politics. Learn more about the book at “Why We Can’t Have Nice Things, Like a More Rational Health Care System” (WBUR), and “We Know that Evidence-Based Medicine Works. So Why Don’t Politicians Support It?” (Monkey Cage).